Is it Friendster for music? I talked to Siren's CEO/CTO Steven Skrzyniarz to find out more. Any success stories so far with this technology? 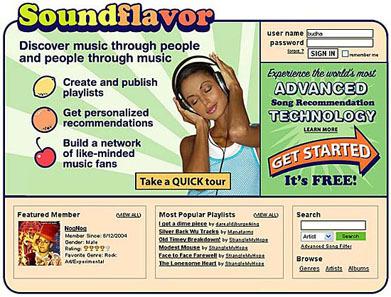 Soundflavor which complement their playlists. combined marketing and distribution package to independent artists. part, layed the groundwork for the MediaSpan deal. deals in the coming months. We're just getting rolling. What kinds of radio stations does the MediaSpan system include? How would you actually find the music there on those sites? station's site to music which roughly fits the station's format. Our services complement those offered by GarageBand.com. and if you like it, click here to purchase." marketing page, and two-minute clips of their songs via CD Baby. We view this as just the beginning in the new marketing programs we can extend to independent artists and labels.